Everyone is talking about Santa coming to town (sorry, it's impossible to resist) and the science section jumped on the bandwagon because we know you aren't sick of Ono yet. But we have good reason to talk to President Ono as he got his start in academia as a scientist and maintains labs to this day. We chatted with Ono about his interest in science, the future of research at UBC and Star Trek. 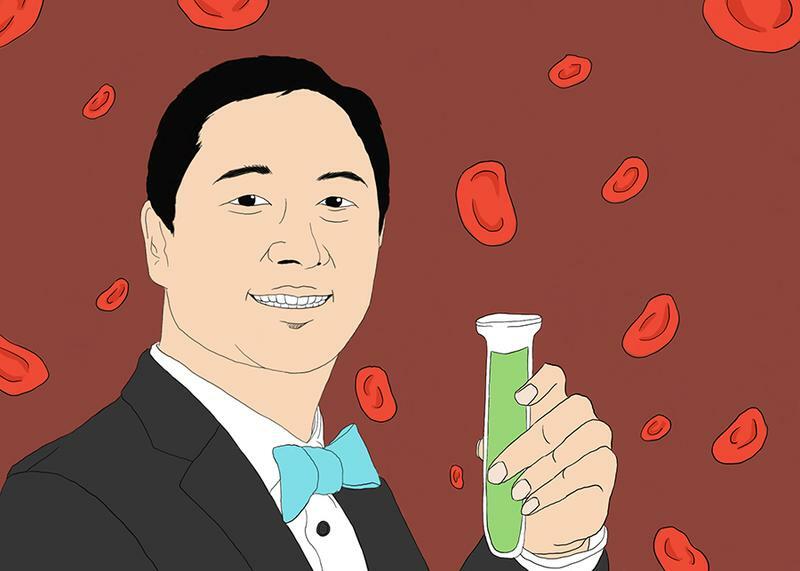 Santa Ono: By training, I’m a molecular biologist and have been engaged with health research for quite a long time. I majored in biological science at the University of Chicago and after that I returned to Canada to pursue my graduate studies in experiment medicine at McGill University. My thesis research involved trying to identify genes that were responsible for Type I, or insulin dependant, diabetes. I did my fellowship in biochemistry and molecular biology at Harvard University where I studied how those disease causing genes are turned on and turned off at the transcriptional level and went on from there to continue to study those genes at first Johns Hopkins University, and then Harvard Medical School, and then University College London. For about two decades I studied the major histone compatibility complex genes and contributed to our understanding of how they are turned on and turned off at the transcriptional level. After that, I started focusing on disease of the eye. I started focusing on understanding inflammation in the eye — in the front of the eye, and the back of the eye — and determined a number of different cellular and molecular mechanisms involved in inflammation in the eye. Inflammation in the back of the eye results in something called macular degeneration which is the leading cause of blindness in the western world. It started when I was in middle school, really. I had a great ninth grade biology teacher. He was truly an outstanding teacher that really tried to set the bar very high and taught at a high level, he didn’t teach down to the students. He really encouraged students to stretch and to learn as much current information as possible. After middle school I was fortunate to have another, second, outstanding teacher whose name is Edwin Lee Gosnell at Towson High School in Baltimore, Maryland. I went to a public school that wasn’t that well resourced in terms of facilities and he used his own money to purchase an incubator for me and laboratory supplies so I could do more research after school than was possible with what was provided by the state. He also would drive me to listen to world class scientists at Johns Hopkins University. I’ve had a long line of amazing people [including Abraham Fuks, Ronald Guttman and Jack Strominger] that have inspired me from middle school up until even present day. What is the focus of your labs at Emory and the University of Cincinnati? We still do some fundamental research on how mast cells, which are granulocytes, are controlled in their development and how they contribute to inflammation. I would say from my days at Harvard, and especially at London, my labs at Emory and Cincinnati really started to think more about how mast cells are controlled. I’ve also focused on macular degeneration more recently. We are trying to develop diagnostic tests that can identify markers in the blood that might allow physicians have an early detection mechanism for macular degeneration. Are you planning on maintaining a lab at UBC? I’ll probably have a small laboratory. It’s still not decided where the laboratory will be located. About 11 years ago UBC tried to recruit me to their faculty of medicine, but instead I went to Emory University at the time. But now I’m coming to UBC and it’s possible that my laboratory will be based in the Department of Ophthalmology and Visual Science. I like taking sabbaticals — I took one at the University of Kyoto and I was on cloud nine because I could actually pipette. What research are you most excited about at UBC? One of the attractions to moving to UBC is that it is a world class university that has an amazing array of research underway. By that I don’t mean simply STEM research, but I consider research in humanities, social science and arts to be research and scholarship as well. What excites me is the excellence and the breadth of research that is underway in every corner of UBC — some of it is truly world class. Some of the human genetics, cancer genomics studies that are going on are really at the cutting edge. I’m really excited about physics at UBC — not only what’s happening at TRIUMF — but also much more fundamental research that is going on in the department of physics. The department of mathematics — where my father used to teach — has some really outstanding faculty members. But also in psychology, in classics, in philosophy as well. I’m pretty excited about the discovery of four planets by an undergraduate and the discovery of disease genes that underly multiple autoimmune disease. What is your vision of research at UBC? One of the important things a president has to do, especially if you inherit a major research university such as UBC, is to help shape its future. One of the things I’m going to do in the upcoming years is to work with the deans, the executive and the faculty to really do an asset mapping of what is occurring at the institution and then develop a strategy of what UBC’s research enterprise should look like in the next five to 10 years. That has to be data driven, it has to start off with analysis of the strengths and weaknesses of what we do. A number of people have this misconception that excellence in research and excellence in teaching are at odds with each other. What I’ve said very clearly is that I believe the greatest universities don’t view there to be a tension between research and teaching. If you look at Caltech, at MIT or at UBC, in certain parts, nobody believes that there is a tension between research and teaching. The best educational experience you can provide to an undergraduate is one where it is easy, in fact it’s an expectation, that undergraduates participate in research or some kind of experimental learning. If you are an undergraduate in a STEM discipline there should be an expectation that not only do you go to classes and you understand the fundamentals of your area of concentration, but you also participate, side-by-side with faculty members, in creating new knowledge. What is your role in supporting and guiding offshoot companies of UBC researchers? No matter how eminent and how developed an innovation ecosystem is at a particular university, you always have the capacity to do more. When you have a research-intensive university like UBC, there is always the possibility of doing even better. As president, it’s very important, with my team, to look at not only the ecosystem at UBC but the innovation ecosystem in greater Vancouver and in Canada. The most ambitious thing I did in Cincinnati was to create a 44-acre research and development park, adjacent to the institution and we’ve actually, with our collaborators in the city, amassed that land and are starting to build physical structures — like an accelerator and an incubator — to create a one-stop shop where R&D countries from around the world actually come to Cincinnati to interface with faculty members at the university. I’m going to take a look at how advanced those efforts are in Vancouver. The more you can involve students, the more innovation will take place at an institution. What dangers do you see in bringing industry and R&D onto a public research institute? We are bringing major fortune 500 companies onto campus in Cincinnati. Certainly, it is very important that you monitor that and that there be no conflicts of interest or conflict of commitment of the faculty. You have to make sure that students, both undergraduate and graduate, are not engaged in activities that are more driven my profit than their education as a student. It’s really, really important that when you bring R&D activities from companies onto a campus, that there be very close oversight. If you do it right, there is a tremendous benefit to having a close synergy with corporate research as well. What role do you, and UBC, have in communicating science to society? It is incredibly important. Much of fundament research is funded by taxpayers dollars. A lot of the funding at UBC comes from the Tri-Council so it’s a responsibility of faculty members, and also the president. We receive hundreds of millions of dollars for research so it’s our responsibility to talk bout how those tax payer dollars are being used and how that research is a benefit to Canada and the province of British Columbia. It’s a privilege and an honour to be a scientist and if you are a scientist, by definition, you are excited by what you do. There is no better person to talk about what you are doing or the impact of what you are doing than the scientists themselves. That’s really, really important for the faculty members, the deans, and myself to constantly be communicating what we are doing. We cannot take for granted the support that we get for the research we do. Is there anything I missed or that you want to add? I cannot wait to arrive and cannot wait to get to know the scientists and the students involved in science at UBC and that I look forward to partnering with The Ubyssey. See a full list of President Ono's publications here. It's only a ten page long list.